It seems no coincidence that Fritz Lang’s first American film, Fury (1936), opens with a close-up that turns out to be a window display. In his next two films, They Only Live Once (1937) and You and Me (1938), lovers linger at shop windows, dreaming. The Woman in the Window (1944) takes this material allure to the next logical level by placing a picture of a woman inside the shop window. Just a few brisk dissolves after Professor Wanley (Edward G. Robinson) has bid a fond farewell to his wife and children at New York’s Grand Central Station, we find him planted in front of a gallery window display marveling at the woman in the portrait. But window-shopping, as Lang is about to prove, can be a dangerous pastime. Sitting around a table at the club with friends, Wanley reveals the rueful inner self that masks his staid exterior. “Life ends at 40,” he complains. “I hate this stolidity, this stodginess I’m beginning to feel.” Returning to the portrait of the woman in the window later in the evening, now augmented by a few drinks, he finds a second image alongside the picture: the ghostly reflection of Alice (Joan Bennett) standing next to him. Lang renders this shot in such a moody, hallucinatory manner that it is easy to believe that this is less a woman of flesh and blood than an apparition. Wanley himself does an incredulous double take, signaling that even he believes it’s a dream. Tom Gunning, in a mightily exhaustive and enormously enjoyable study on Lang (a book that is reason alone to revisit the entire Lang corpus), points out that “from original reviewers down to contemporary student audiences, most viewers moan at the revelation that it was all a dream.” (1) The iron hand of Fate which ruled Lang’s German-period films gave way in Hollywood to a greater ambiguity. He claimed that the dream-ending of the film was a way for Wanley to not be caught in the machinery of fate. Still, it is useful to remember that Lang’s most significant contribution to The Cabinet of Dr. Caligari (Robert Wiene, 1919) was to introduce the framing device of a dream, which horrified the original writers of the film and led Siegfried Kracauer to charge that “a revolutionary film had thus been turned into a conformist one.”(2) Lang thought that the dream-device and spuriously happy ending of The Woman In The Window had contributed to its commercial success and chuckled that it was “such a corny old trick that it seemed almost new” when he decided to press it into use one more time. The film’s origins lie in a popular bestseller of the time, Once off Guard by J. H. Wallis. The scriptwriter Nunnally Johnson, who had penned several John Ford films including The Grapes of Wrath (1940), had formed his own independent production company and chose The Woman in the Window as its premiere project. Not working with a big studio watching over his shoulder, Lang enjoyed a great degree of freedom on the film, which allowed him to travel to New York for research before the sets could be constructed with his customary insistence on authenticity. 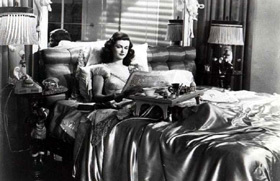 Lang substituted the suicide ending in Johnson’s script with the Caligariesque dream-ending, citing as justification the Production Code’s customary disapproval of suicide as a ‘story solution.’ Given the increasing employment of Freudian ideas in 1940s Hollywood narratives, the new ending was scarcely unusual. In Fritz Lang’s cinema, passion may burn, but it leaves traces. These traces are raw material for the processes of science, and all characters, both good and evil, make equal use of scientific resources. After Wanley disposes of the body, his district attorney-friend Lalor tells him that the height, weight, length of stride, type of shoes, type of automobile and even the level of economic means of the killer have been established. Heidt the blackmailer conducts a fetishistically thorough examination of Alice’s apartment, in no less a methodical manner than a forensic expert would. Wanley leaves behind blood and fabric traces, and burns his jacket and the victim’s straw hat. Add to these actions an inventory of objects that suddenly assumes great significance after the killing (like his monogrammed pencil, vest, and the dead man’s watch), and we can see how the trail of culpability is marked by visible crumbs of guilt. Reminding us of Lang’s lasting influence on Hitchcock, scenes of secrecy and intrigue occur in unlikely locales. Seconds before stabbing a man to death, the professor is doing nothing more harmful than trying unsuccessfully to open a bottle of wine with a pair of scissors (the use of this domestic implement thus looking forward to Hitchcock’s Dial M For Murder ). When Wanley gives Alice the poison to use on Heidt the blackmailer, their rendezvous occurs not in a dark alley but in the perversely well-lit lobby of an office building. In another sign of the film’s quiet, dry humor, several characters including Heidt and Lalor wear an identical straw hat. In the film’s funniest scene, a chubby, geeky Boy Scout appears in a newsreel announcing seriously, “If I get the reward, I will send my brother to a good college and I will go to Harvard.” Lang’s undeserved reputation for humorlessness exists only because his dark wit is cloaked in Germanic gravity. Referring to Lang’s Human Desire (1954), a remake of Renoir’s La Bête Humaine (1938), Andrew Sarris pointed out that “if Renoir is concerned with the plight of his characters, Lang is obsessed with the structure of the trap.” (3) Time is, for Lang, a perennial reminder of this trap. Both the men’s club and the Wanley home echo with ticking clocks, carefully foregrounded in the sound mix. A luminous clock presides over Alice’s apartment building, and every time a character enters or leaves, the audience can time-code the march of the fateful night. Lang also uses mirrors to reflect, multiply and expand a room and its contents into a suffocating thicket of entrapment. As a signature device of the director, the large mirror surfaces in Alice’s apartment literally capture the action, holding it prisoner while Lang and the audience examine the creatures the camera has caught in its trap. We the audience become, in Wanley’s phrase, “armchair adventurers” on a pitiless hunt. Tom Gunning, The Films Of Fritz Lang: Allegories of Vision and Modernity (London: BFI, 2000) 292. Quoted in Patrick McGilligan, Fritz Lang: The Nature of the Beast (New York: St. Martin’s Press, 1997) 61. Andrew Sarris, The American Cinema (New York: E. P. Dutton, 1968) 64.